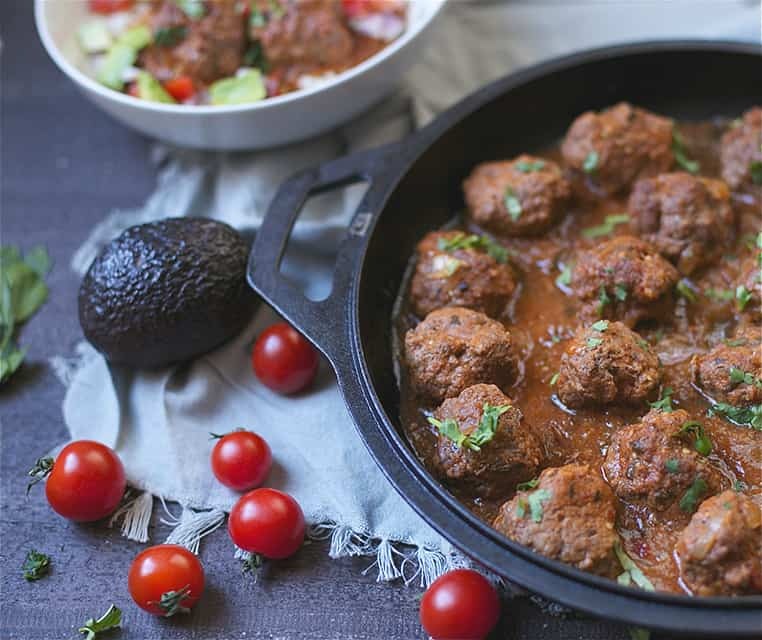 Chipotle Enchilada Meatballs have the most incredible smoky flavored sauce! Appetizer or dinner, these are sure to please for any occasion. 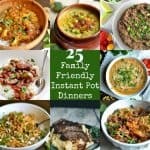 So easy to make in the slow cooker, stovetop, or Instant Pot! Recipe is also Gluten-Free, Paleo, and Whole30 approved. I have the best news, I’m getting a NEW KITCHEN!!! Wooohoooo!!! This past week we solidified some kitchen plans for a brand new eat in kitchen island, new countertops and backsplash, and some bench seating. I can hardly wait, and I can barely stand it! I can’t wait to show you all pictures of my kitchen, but in the meantime, I’ll just share some meatballs. Because, that is why you’re reading, right? You guys…….You’re going to flippin love these!!! 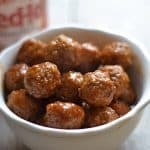 I am about to state the obvious: I love chipotle, I love enchiladas, and I have a thing with meatballs. So Chipotle Enchilada Meatballs it is!! And I must say, the sauce is boss in these meatballs. Consider that you are totally normal if you have thoughts of bathing yourself in this deliciousness. So what’s in the bossy sauce? Some chipotle peppers, salsa verde, fresh cilantro, garlic, and sautéed onion. 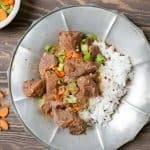 Slow Cooker, Instant Pot, or stovetop, it won’t matter! I have you covered for all 3 options. 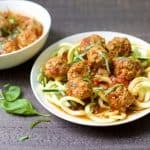 Regardless of which way you make these meatballs, you will need to bake the meatballs beforehand in the oven under the broiler for a few minutes. This prevents them from falling apart in the slow cooker or instant pot. You’ll have dinner or your appetizer ready in no time. Serve over cauliflower rice, or plain, with your favorite toppings! I loaded mine with avocado, more cilantro, chopped tomatoes, and green onions. If you’re a cheese lover, load them with some shredded pepper jack or monterey jack! So many good options. These were loved and adored by the whole family, and made a yummy lunch the next day. 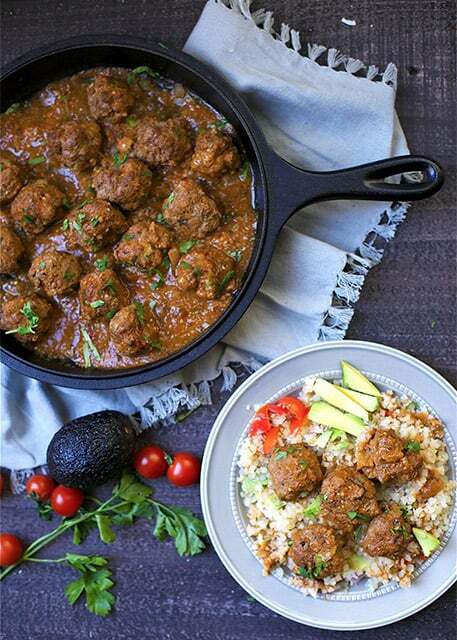 Make your meatballs: In a medium sized bowl, mix together ground beef spices, almond flour, and egg. Continue to mix with your hands until well combined. Roll into 1-2 inch balls (your choice, I prefer bigger meatballs). Place on a large roasting pan or cookie sheet. Move to the oven once hot, and broil for 4-5 minutes. Meatballs won't be cooked all the way, but will cook more with the sauce. Now make your sauce: In a large saucepan, heat up your oil over medium- medium high heat. Add your onions and garlic. Saute for 5-6 minutes until fragrant. Now add in salsa verde, chipotle peppers, adobo sauce, and chicken broth. Let the flavors meld and cook for approximately 10 minutes. 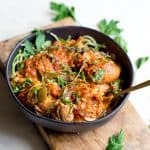 Place sauce in a food processor or blender (be careful with the heat in a blender, as the top will expand with heat and you should leave a hold or opening while blending). Add in cilantro, and continue to blend until smooth and well incorporated. Return the sauce back to your pan, and add meatballs (leaving behind any residual fat). Cook for another 15 minutes over medium heat, stirring occasionally. Serve hot! 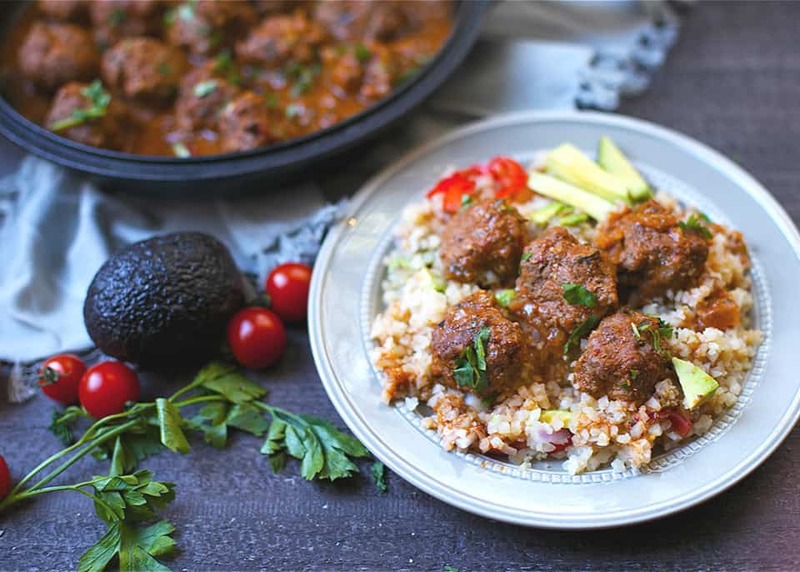 Place meatballs inside the slow cooker, leaving behind the residual fat. Cover with your sauce. Cook on low for 4 hours. Serve hot! To make the sauce: Place salsa verde, chipotle peppers, adobo sauce, chicken broth and cilantro in a blender or food processor. Blend until smooth. Now set your instant pot to saute function. Once hot, add in oil and saute onion and garlic for 3-4 minutes. Add liquid ingredients to the instant pot and cook for another 2-3 minutes. Place meatballs on top of the sauce, select cancel. Secure the lid, select manual function. Cook on high pressure for 7 minutes. Use a quick release, and serve hot! *Salsa verde can be found in the Mexican section of your grocery store. Use a brand with minimal ingredients. The Trader Joe's brand is delicious and Paleo, Whole30 compliant. **If following a strict Paleo or Whole30 diet, it is very difficult to find complaint Chipotle peppers in adobo sauce. Instead, you can substitute with 1 tbsp chipotle spice, 1 tbsp tomato paste, and 1 tbsp apple cider vinegar. Stir to combine the three ingredients. 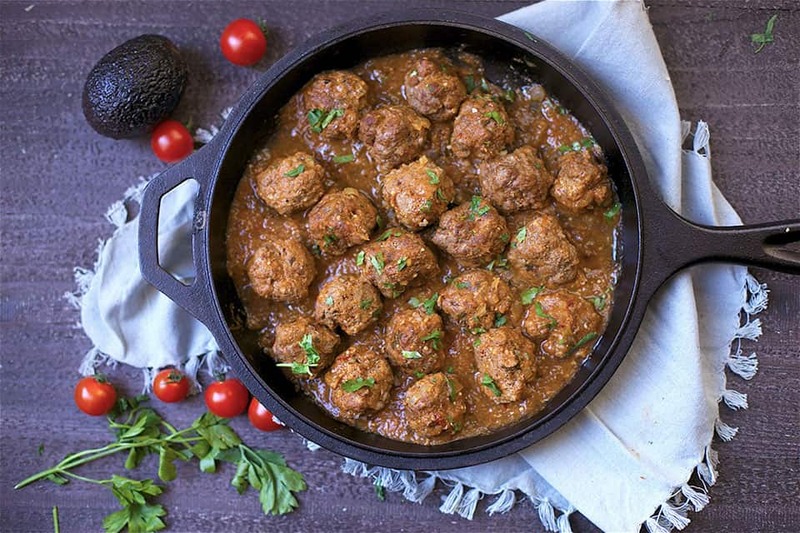 Enchilada meatballs. I think I’ve died and gone to heaven. NEED to try these ASAP! 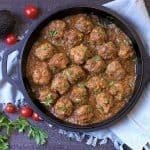 These meatballs and the sauce are absolutely delicious! I have made them several times 🙂 I love this blog! 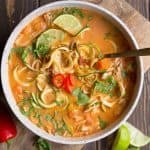 Thank you for sharing your amazing recipes! 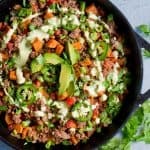 Is there a particular brand chipolte chili in adobo sauce that is Whole 30 compliant? I am having difficulty finding this. soooo good, very easy also. My husband actually high fived me after his first bite! Only 4 meatballs weren’t eaten at the first sitting and I kept them all for myself!